This is an occasional column on powerful people doing powerful things. The Church of the 1950's is done and dead. People talk about how the Church needs to change. This column highlights people living that change now through creative thoughts, methods, and endeavors. First up is Abby Mohaupt. Abby is an artist and Pastoral Resident at First Presbyterian Church, Palo Alto. I met Abby through Sara Miles who thought we would like each other. And we do! 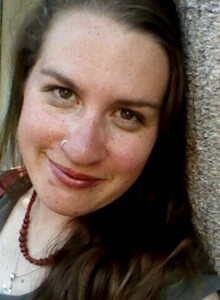 Abby Here Abby write about compost and yoga--two of her loves. These are moments of God—of grace—incarnate.